Home » Baseball » We have just witnessed the greatest Baseball game of All Time!!! We have just witnessed the greatest Baseball game of All Time!!! 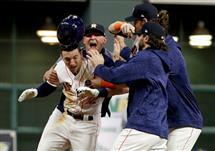 The Astros and the Dodgers battled each other for almost six hours and after 25 runs between the two squads, the Astros pulled through in the tenth inning. The game that was supposed to be a pitchers duel turned into, which team can keep the ball in park and resulted in joy for baseball fans everywhere. I do not have a rooting interest in this series, if anything I am probably rooting for the Dodgers since the Astros knocked the Yankees out of the playoffs, but I just want to see some great baseball. Game 2 of this series was great in which both teams scored multiple runs in extra innings, but that game is going to be overshadowed by what we just saw. The Dodgers had lined up their best pitcher, Clayton Kershaw to face Astros’ ace Dallas Keuchel in the pivotal Game 5 of the series which is tied at two. The pitchers were terrible in this game, Keuchel did not even make it out of the fourth inning and Kershaw gave up six earned runs. The Dodgers who had three run leads twice in the early stages of the game, came back to score three runs in the ninth inning to tie the game at 12. The bullpens were terrible and the Dodgers were forced to pitch their closer, Kenley Jansen for thirty pitches in extras and he simply ran out of gas after pitching in Game 4 to save the lead. The Dodgers had many opportunities to end the game but ended up blowing leads. The balls in this series are for sure juiced as both teams are hitting home runs easily and the balls are flying out of the ballpark. I do not mind the juiced balls, as it levels the playing field and MLB has made the right decision by juicing the balls to attract more attention to the World Series and the sport of baseball as a whole. The Astros now take a 3-2 lead as the series heads back to Los Angeles. The Astros bullpen is terrible and almost cost them a game in which they were up by three runs going into the ninth inning. Justin Verlander will be taking the mound for the Astros in Game 6 and he will need to go deep into the game to avoid the possibility of the Astros bullpen blowing another lead. There are so many highlights from this game, but none bigger than what happened in the top of the ninth inning. After the Dodgers were inching closer to tying the game, we can see fans arguing in the stands. I will have a full recap on the World Series as soon as it ends, but right now my body needs to go to sleep.